Waringstown kept the pressure on Premier League leaders CIYMS with a six wicket over Armagh at The Lawn on Saturday. Armagh were put into bat by Waringstown captain Greg Thompson, and got off to a fantastic start, with openers Jamie Rogers and Neil Gelston bringing up their 50 parternship in the 11th over. Looking untroubled, the pair continued but at a slower rate with the spin of Kyle McCallan and Lee Nelson introduced, and it was the former that made a vital breakthrough, bowling Gelston for 35 with the total sitting at 84. When Harry Doyle was trapped LBW for 0 by Nelson, Armagh needed some stability with Rogers in the thirties at this point, and Colin Russell provided just that, making his way to 21 before being bowled by James Hall. Rogers reached his half-century in the 29th over from 66 balls, bringing up Armagh’s 100 in the process - registering his second league 50 of the season after hitting one in vain against Carrickfergus earlier in the campaign. Shadley van Schalkwyk took control of the scoring and was playing some delightful strokes, including a straight six off McCallan. With the score at 177, Rogers chipped a Nelson delivery to Thompson at mid-off, departing for a well-made 76 from 91 balls, including nine fours. Captain Matthew Steenson and van Schalkwyk were dismissed in quick succession, with Shaheen Khan claiming his fellow professional for 43. Some late order hitting from Michael Hoey and Gareth McCarter brought Armagh to 235-9 at the close of their innings - a total they would have taken at the start of play. It was their best batting performance since their return to the top flight, with Rogers in particular showing great control and an array of shots. Being 84-0 after 20 overs, they would have perhaps been looking closer to the 260 mark, but they had certainly given their bowlers something to have a go at. Lee Nelson was undoubtedly the standout bowler for the hosts, picking up figures of 3-21 from his 10 over spell. Waringstown have so often got off to a positive start this season, and this game proved no different, with Adam Dennison taking three fours off a single Doyle over to bring himself to 24* in the space of six overs. The visitors were bowling too short and the talented duo of James Hall and Dennison weren’t going to miss out, and brought up their 50 partnership in the 10th over. Armagh were in desperate need of a breakthrough, and Matthew Wright gave them just that when he got Dennison to edge to Gelston in the slips for 35. Hall was starting to find his groove, and took 20 from a Wright over, including two huge sixes, and reached his second half-century in as many days. 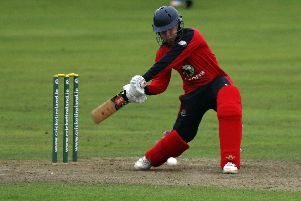 Gelston had got Armagh’s second wicket, bowling Ross Waite, but that brought Nelson to the crease, and the all-rounder continued his productive day by taking consecutive fours off the bowling of Hoey, and then two in the next over off Doyle. Hall continued to look dangerous but had limited strike with Nelson hitting the ball so cleanly from the other end, and was bowled for 61 by the returning van Schalkwyk in the 26th over. Khan, fresh from a match-winning 124 in the Challenge Cup semi-final against CIYMS two weeks ago, was wasting no time, dealing in boundaries, including a massive six off his legs from the bowling of van Schalkwyk. He was trapped LBW by Gelston soon after with 69 runs still required, but Nelson and skipper Thompson combined to see the team home. Nelson brought his 50 up in the 39th over, including nine fours, with Thompson taking 16 from a single Stuart Lester over, all via the sweep shot. Thompson was in a rush to seal the victory, hitting three massive sixes to seal his own half-century from 38 balls, ending on 51* while Nelson finished 54*. It was Armagh’s finest performance this season against the reigning league champions. With Muckamore’s six wicket win over CSNI at Stormont, Armagh now must beat the Antrim side next weekend if they are to stand any chance of staying in the top flight. Waringstown and CIYMS are separated by only run rate at the top of the league, with the Belfast side beating Carrickfergus by seven wickets.